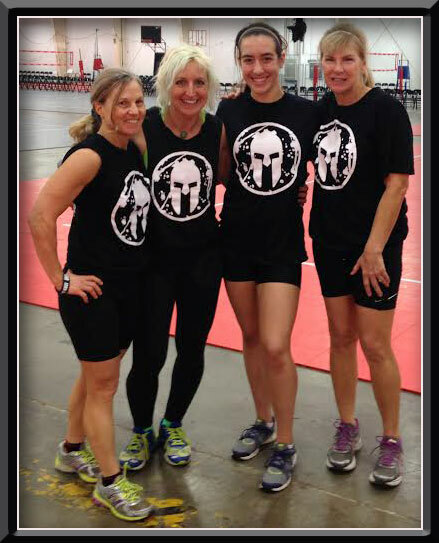 Michele and Christina on the far right took me under their wing at the Spartan workout. Next to them is Andi who was our instructor for the day. It was a really fun day! What are your reasons for weight loss? What are your reasons for embarking on this journey in the first place? What are your goals? Keep them in the forefront of your mind as you move forward. I remember when I was frustrated, overweight, and obese for so many years. My goal at first was simply to get back to health, maybe wear a size 8 or so (the smallest I’d ever been as an adult), and just be able to enjoy life and physical activities with my family the way I’d used to. Since I started working in law enforcement I also wanted to be a super fit chick and be able to do all of the physical duties well. What happened instead, to my absolute horror and disappointment, is that my weight crept up until I’d finally reached the obese category. I hadn’t yet learned what the Venus system taught me; that there was nothing wrong with my metabolism – I’m just a tiny person. Tiny people don’t need so much food. When you are overweight it’s hard realize how small you really are, but your height should give you a clue. In general, when you are short – you are tiny. Just because you have a lot of muscle for your height doesn’t mean you get to eat more (if you want to stay trim). My muscle is off the charts high and I still only get to eat the same amount as the average 5’1″ female. That’s because muscle does not burn as much energy as your internal organs. Even when we exercise many of us don’t really get to eat that much more either. Of course we burn some energy when we work, but not nearly as much as all the HRM’s report. Even at 12% body fat I don’t get to eat that much more, although I do have to consider it more now when deciding how much to eat each day. I base the amount on how I feel – not a calculator or what some fitness guru says. If I’m gaining fat that is a huge clue, in fact the only clue, that yes I am eating too much food if my goal is to lose or stay the same. The bottom line is that you can’t outwork or outrun too much food. My goals changed along the way. I had reached size 8 before joining Venus. Why did I keep going? My friend told me about Eat Stop Eat and I wanted to learn WHY what I was doing for fat loss finally worked. Through Eat Stop Eat I found the Venus Factor. With Venus I found the goals to achieve the ideal shape intriguing and frankly I LOVED the workouts. So with these two programs I exceeded my wildest dream of ever being fit. I even finally impressed some pretty fit guys at the Sheriff’s department and yes I can now do my physical duties well! It’s okay to change your goal, but it’s important to think about why and make sure you don’t let your fitness goals get hijacked. Neither of these fit my long term purpose; to be healthy, functionally strong, have a good quality life into older age, and feel good about my shape. Yet I find myself striving for both of those at times and I have to pause and think about it. It’s not wrong to pursue either of those, it’s just that sometimes I might have other goals and these may conflict with those. So I take a deep breath and realize I let myself get goal hijacked once again by going down a strange female emotional path. We are all human after all. The best I can do is be aware that this is what happens to me and then get back on the right track. I just let it go and remember why I started this journey in the first place. John likes to remind me that I already proved what I needed to prove when I finished my contest pictures. I’m done. I don’t ever have to do it again. I don’t have to keep proving it. I can just live my life now. I’m happy and healthy. But I am merely human, I get sidetracked with these hijack moments, and I am a bit hardwired to keep improving and be my best. So I’ll just keep reminding myself that I’m living my dream already, and Randy will keep nudging me when he sees me veering off track. Recently I almost let myself get hijacked again with #2. I had started training a client who wants to improve her strength and get a bit leaner for Spartan Races. I’d never heard of Spartan races before and it kind of sounds like fun, so I went to a Spartan workout event to check it out. It was a fairly intense 2 hour workout. I met a woman close to my age with the daughter of a friend of hers, Michele and Christina. I had never been to one of these events so they took me under their wing during the workout and we had a fun picture taken at the end of the day. When I checked in at the event they had T-shirts for everyone. I’m pretty small, only 5’1″ and with the small T-shirt fitting kind of loose and being middle aged I could tell no one really thought much of me at first. But as the hundreds of people lined up in rows and I blended in with the crowd for the 2 hour workout people around me started noticing me purely by my strength. With no prior experience I could pretty much do anything the instructor threw at us. At rest we were supposed to hold the plank position. For example when the Spartan instructor (Andi Hardy) said do 10 pushups, she also said if you can whip them out quickly and it’s too easy then keep doing them or get in the plank position and rest there. Then she said if pushups are too easy (me me, yes, pick me! haha) then do the dive bomber pushups. So I started doing dive bomber pushups. Then when she called out burpees I did the dive bomber pushups with those – and yes that finally got me tired out by then end. I was able to do the duck walk across the gym, alligator crawl, and a bunch of other stuff. It was all a FUN DAY, I got a really cool T-shirt, I made some new friends (Michele and I are staying in touch), and I re-established my long term goals, but I must admit it aggravated the arthritis in my hips for over a week afterwards. I am 53 years old after all, and my hip problems are hereditary. For me the day was a real testament to the awesomeness of the Venus Factor workouts. Venus is all I ever do besides a little HIIT running and low intensity cardio. Venus workouts made me functionally strong. This is why I recommend the 3 day a week workout as cross training for these types of endurance races. The reason I can even do the dive bomber pushup is a direct result of the Venus Factor workout, so I called it a Venus Factor dive bomber pushup – but it is not actually part of any of our workouts. From now I will almost always do the dive bomber pushup when the workout calls for pushups. Why? Because I can – and it still fits my long term goals. Michele has done several races and said she can tell I’m strong enough right now to any of them, even the long races. So I got caught up in the idea. I almost let myself get goal hijacked again. The week after this event was a reminder to me why doing this type of workout too often goes against my current goals. Even though I’m strong and was able do whatever was thrown at me there that day – I paid for it later. I’ve been a bit sore all week, swollen from the soreness, bloated, and extremely hungry all week. So hungry that I know I went over my maintenance intake several days. I also had a bit of fatigue induced insomnia (this happens more in my middle age) which also helped to increase my hunger hormones. As disciplined as I am with food it’s not enough to combat this type of hunger. It’s not an “I’m bored” or “I just want to eat more” hunger. It’s a deep hunger caused by fatigue. It’s the type of hunger that if I try to fight too hard I won’t be able to sleep and the hunger will increase. Some of this is caused by the fact that I’m still extremely lean for a female (as shown with a DXA scan). So I ate a bit more food, choose healthy food, ate it slowly and with purpose, until I’d had enough that I could sleep peacefully. I was not happy that I ate more than maintenance, but I know I ate what my body needed at the time. This does not help me stay lean if that’s what I want, so this type of training goes against my goals. If I do a Spartan Race it will be for fun with a team, maybe once a year or so. I’m pretty much done with too many of the ultra intense workouts that push me to extreme, make me fatigued, and increase my hunger hormones through the roof. On occasion it can be a good test of my strength. I just need to know that I will have a week of extra hunger, bloating, and aggravated arthritis after an event. It’s not something I want to do very often. On the other hand I could change my workouts to include some Spartan workouts. I could condition myself to do more animal moves, burpees, climbing ropes, mud crawling, and spear throwing and I wouldn’t get quite as sore from an event. But that would increase my core and as you can see from the video my core is pretty thick for a female even now at 13-15% body fat. It’s not always so attractive. It’s part of what I don’t like about my shape, and it is partly why I tend to want to strive for getting leaner and back to a size 2. Another drawback for me is that my arthritis would still be aggravated by those types of workouts. So again there is nothing wrong with deciding to do any kind of intense race or workout if it fits your goals and your lifestyle. Even though it would be a totally fun challenge for me, getting competitive just doesn’t fit my main goal for fitness at this point in my life. I’ve already achieved my fitness and shape goals. I just need to maintain, which alone takes effort and I’m a pretty busy girl these days. What will you do to keep on track with your own goals and not allow them to get hijacked? Remember your long term goals and why you chose them. If you decide to change your goals think about WHY you are changing them and does it really match how you want to live your life?